Still heralded as an untouched paradise, Myanmar is unlike its neighbouring countries when it comes to tourist fare. Having opened its doors to the world less than a decade ago, the former British colony retains its wondrous natural beauty – unspoilt, untouched. From exploring the busy streets of Yangon, to wandering around majestic stupas and pagodas in ancient Bagan, or taking a well-deserved breather at the serene Inle Lake, Myanmar is simply breathtaking. And that’s only 3 of the many cities which we visited! Not to mention the locals whom are probably one of the nicest people in all of Southeast Asia. Highly due for a second visit soon. In the meantime, sit back, relax and start booking your flights soon as we bring you on a mesmerising journey – 13 Magical Things to Do on Your Honeymoon in Yangon, Myanmar! Shwedagon Pagoda is the most recognizable landmark in Myanmar. Standing at 99 meters (325 ft) tall, this glistening Buddhist shrine is covered in 27 tons of gold leaf and embedded with thousands of precious stones like diamonds. Resting on a small hilltop, it is hard to miss while walking anywhere along Downtown Yangon. Within the main stupa lies sacred relics like some strands of the Gautama Buddha’s hair along with three other Buddhas that preceded him. To avoid the crowd, head down early when it opens at 6am. Otherwise, enjoy the golden glow intensified by the setting sun or wait for the spotlights to light it up at night. Kick back and relax after a day of exploring in the opulent Pan Pacific Yangon, where luxury meets style. All rooms are installed with floor-to-ceiling windows, allowing guests to wake up to the beautiful Yangon sunrise each day. Luxury and relaxation are available in every corner. From the in-house spa to the outdoor infinity pool, allow your worries to dissipate as you enjoy a traditional Myanmar massage or gaze at the lush views of the city and the glittering Shwedagon Pagoda. We absolutely recommend lounging at the pool during sunset and giving the traditional Myanmar massage a shot! When it comes to dining options, Pan Pacific Yangon boasts a number of local and international restaurants including the Saan restaurant where you can feast on modern Myanmar and international cuisine while admiring the view of the Trinity Church. The Teak Bar offers a unique range of cocktails come sundown, while the award-winning Hai Tien Lo restaurant serves authentic Cantonese cuisine. Booking a Pacific Club room or suite? You’re in luck! This gives you exclusive access to the Pacific Club Lounge on the 25th floor, boasting a sweeping view of the city. What more, the hotel is situated on top of the Junction City mall and right next to the Bogyoke Aung San Market. Talk about convenience! Expect tons of hiking and walking to fully enjoy the wonders of Myanmar. The end result? Probably aching and sore limbs, but there is nothing that a traditional Myanmar therapy massage can’t fix. Head down to the St. Gregory Spa and Wellness Center at Pan Pacific Yangon, where you can get pampering spa treatments while enjoying the sauna, steam room, and jacuzzi. The massage therapists we had really worked on easing muscle aches and knots, even using their elbows masterfully in the process. Probably one of the most revitalising massages we have experienced amongst all the Southeast Asian countries we have been to. Experience how the locals get around via this old school train! Built in 1954, this train service started during the British colonial period. It connects towns and other remote areas to the main metropolitan area of Yangon and is comprised of 39 stops. While the train is primarily used as a daily mode of transportation, it is also a great way to go around and take in a snapshot of ordinary life. This is probably the cheapest tourist attraction! Do your morning stretches while out on a stroll along the boardwalk of Kandawgyi Lake for free. This man-made lake, built during the British era, is referred to as the Royal Lake. Enjoy views of the golden Shwedagon Pagoda just beyond while taking in the calm beginning of the day. On its eastside lies a concrete rendition of a royal barge, Karaweik Palace, offering buffet meals and cultural performances. For a small entrance fee, visitors can also check out a park and a playground. Beyond the lake’s horizon is a popular building called Utopia Tower, which houses a bar, karaoke, viewing deck, and gallery. Two and a half millennia ago, during the time of Gautama Buddha, this small yet highly important pagoda was built. The name Sule is actually a revised version of “Su-Wei”, meaning “meeting” in Myanmar language. The reigning monarch at that time, King Ukkalapa held meetings for the Shwedagon Pagoda here. Its middle stupa is called Kaiyk Athok and is said to contain a sacred strand of hair, exactly as its name suggests. Over the years, its structure was built upon, effectively enlarging it. By the north entrance, there is a small golden royal barge where you can place prayer cards into. The Sule Pagoda sits at a rotunda, the veritable centrepiece of Yangon. Looking for a snapshot of local Yangon life? Head down to Botahtaung Harbour, a popular harbour where small boats used by locals for transportation are aplenty. The river cruise via the ferry offers a different perspective of Yangon as well. For those feeling adventurous and a little peckish, do give the small local restaurants nearby a shot! The sunset view here is magnificent, providing a perfect end to a day of exploring. A wisp of mystical magic surrounds the Yele Kyauktan Pagoda. The pagoda used to be just 11 feet tall and built in the mainland back in 3 BC. It was moved onto an isle in the middle of Hmaw Wun Creek in 1939. This small pagoda complex doesn’t seem to flood no matter how high the tide rises. Even with the limited space, no one has ever been turned away as the crowd seems to just fit inside somehow. The centrepiece of this complex is the image of a golden Buddha housed in one of the elaborately decorated rooms. Visitors may feed the fish that monks set free here. 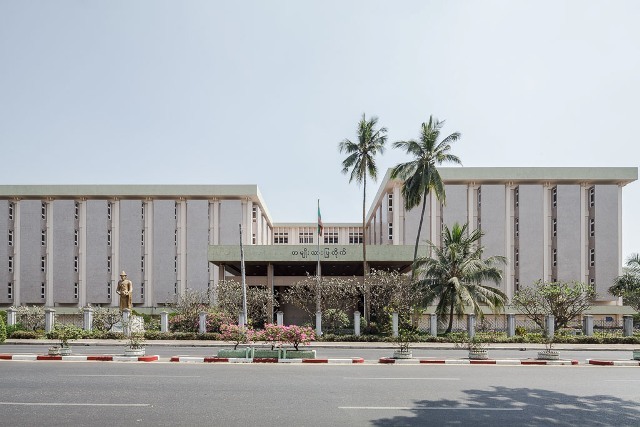 Step into the life of old Myanmar royalty in the National Museum of Myanmar. Inside, you will find endless bejewelled furniture, magnificent artwork, and fascinating cultural relics that date back to prehistoric times. Chandeliers that once belonged to colonial-era State House lights up each floor of the museum. The early Burmese kings lived luxuriously, evident in palatial palanquins, gold-embroidered rugs, and ivory kitchen chairs. The most spectacular of all is the Sihasana, a lion throne covered in jewels that belonged to the last king of Myanmar, King Thibaw Min. Built during the first years of the 20th century, St. Mary’s Cathedral is the biggest Catholic church in Yangon, occupying 15 acres of land. The majestic and colourful interiors contribute to its magnificence. St. Mary’s Cathedral has undergone several renovations due to the multiple disasters it managed to live through – earthquakes, cyclones, and the World War Two invasion. Multiple national races make up Myanmar, namely Mon, Chin, Bamar, Kachin, Kayah, Kayin, Shan, and Rakhine. Jointly built by the Ministry of Progress of Border Areas and National Races and Development Affairs, the National Races village celebrates the unity of these peoples. One house dedicated to each group also celebrates their uniqueness. Expect crowds on the weekends, with traditional dance performances held in the Union Hall starting at 2:00pm in the afternoon. For last-minute souvenir shopping, there is no better place than Bogyoke Market. The shoppers’ haven, formerly called Scott Market, is packed with over 2,000 shops that sell everything from local handicrafts to luxury items. Find everything from clothing, tableware, artwork, traditional bags, to jewellery. North, south, east, and west wings make up the establishment. Each wing houses a good mix of shops, so take some time to scour the entire market. Buy local slippers and cotton or silk longyi (sarong-style bottoms) for about K5,500-9,500. If visiting in mid-April, make sure to go there pre-Thingyan festival (Myanmar New Year festival) to see people all dressed up and witness special festival events. These casual establishments are hard to miss as they line the streets side by side. For only K200 (US$0.13 or S$0.18), enjoy authentic Burmese tea, prepared by mixing evaporated and condensed milk with potent black tea. These streetside teahouses may not look like much with their plastic chairs and tables, but business and political affairs actually happen here. 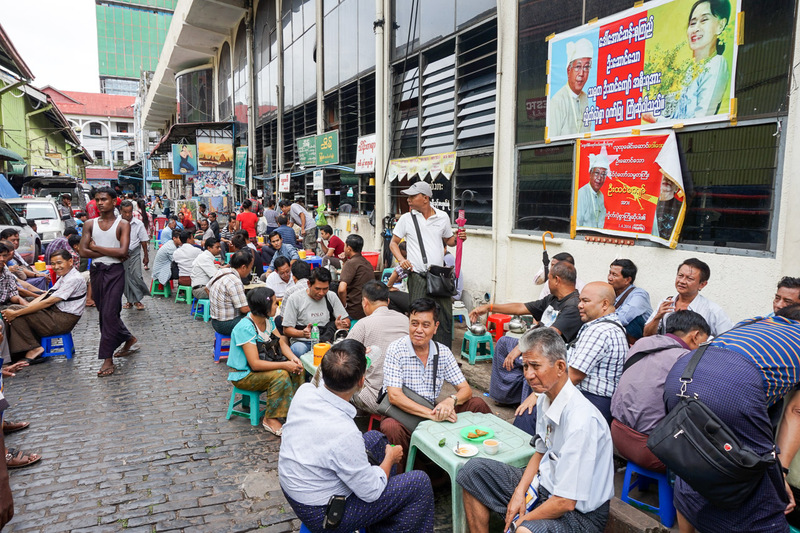 Myanmar is one of the very few countries which has people both drink and eat tea. Try sampling lahpet as well, which is fermented or pickled tea leaves. This chewable tea is rooted in symbolism as well – warring kingdoms used to offer these as a peace offering to each other. Situated right in the middle of the city, the 5-star luxury Pan Pacific Yangon provides sweeping views of the surrounding landscapes. Whether eating at one of the in-house restaurants or hanging by the poolside, the glistening Shwedagon Pagoda helps to brighten up the landscape view. Do try the authentic Myanmar massage offered by St. Gregory Spa and Wellness Center, we highly recommend it. Click here to book your honeymoon at Pan Pacific Yangon today! This post was brought to you by Myanmar Tourism Marketing (MTM) and Pan Pacific Yangon.